PET FOOD — CRC INC.
Commission Celebrity Dog Mom Lo Bosworth as the Puppy Shower celebrity host. 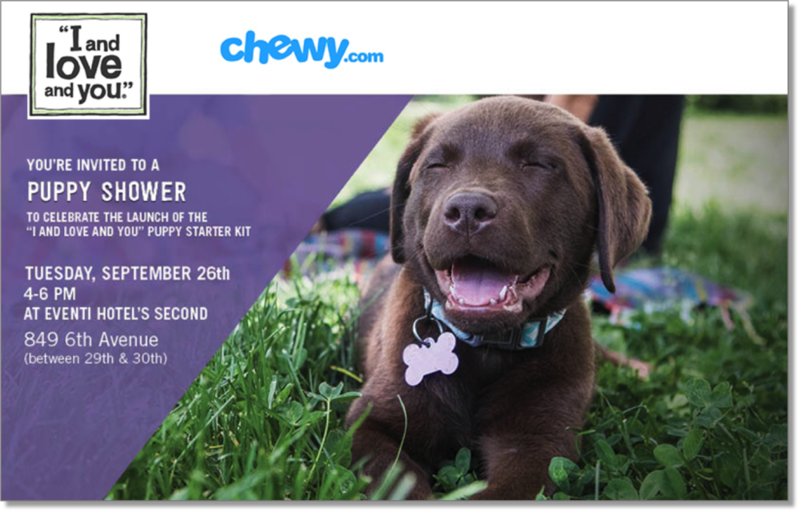 Invite notable media, influencers, and friends of Chewy to the Puppy Shower celebrating the new launch of the Puppy Food Starter Kit, emphasizing its purpose of helping get pets settled in their new homes. In addition to to highlighting the new product launch, ILY ‘showered’ three ’Pup of Honor’ recent shelter adoptees from Animal Haven with gifts. Host an influencer and media attended Puppy Shower event to introduce the newly launched ILY Puppy Food Starter Kit to consumer, trade publications, and top tier influencers in a celebration to honor 3 recent dog adoptees from shelter partner Animal Haven and new puppy families everywhere. 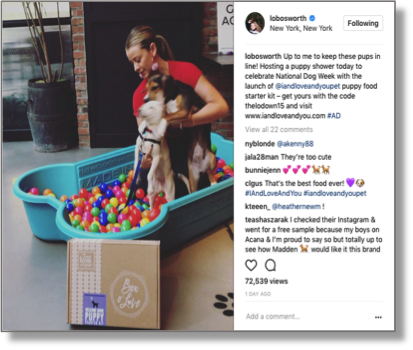 Secured 6 on-site media interviews with celebrity dog mom Lo Bosworth, including but not limited to; Manhattan Digest, US Weekly, and New York Post Page Six. Secured social media post and featured blog post on TheLoDown for ILY Puppy Shower and Puppy Food Starter Kit. Distributed ILY Puppy Shower and Puppy Food Starter Kit press release resulting in 84,089,548 media impressions to date. Secured 7 stories mentioning ILY Puppy Shower and/or Puppy Food Starter Kit to date, including People.com, The Lo Down, US Weekly, New York Post, Harlem World Magazine, Making It In Manhattan, and Manhattan Digest resulting in 75,112,050 media impressions to date. Secured 1,018,962 social media impressions featuring ILY Puppy Shower from attending media, celebrity, and pet influencers.